I have condensed the questions, which appeared in long-form in the questionnaire sent to candidates with background information and examples, to highlight each candidate's answer. This year there were ten questions. These are the responses provided by Abbey and Will. You can also read responses from Tim and Reno, Joe and Connor, Chris and Meredith, or Sara and Ryan. 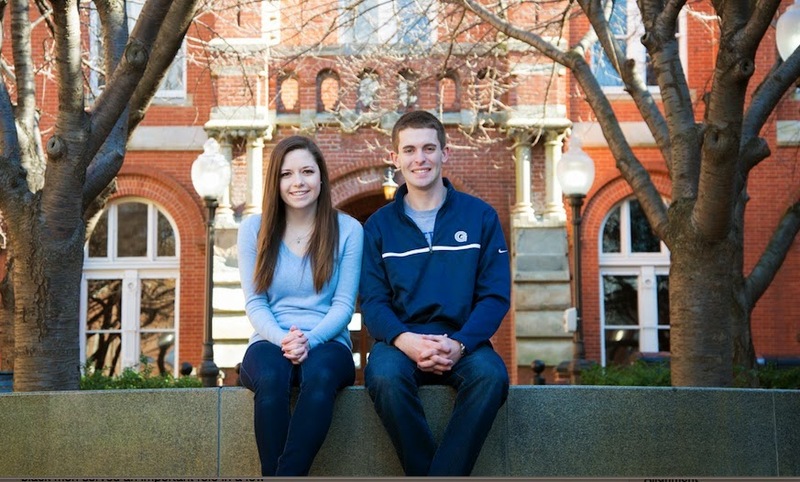 Photo: Abbey and Will smiling as they sit together in Dahlgren Courtyard. 1. What would you do or change to combat ableism (disability oppression, prejudice against the disabled) and make Georgetown a more welcoming and inclusive campus for disabled students if elected? We want to create a culture where disability is viewed as an aspect of diversity, which will require GUSA to empower and engage students with disabilities to ensure that GUSA is doing everything in its power to make Georgetown a more inclusive campus. This will require that students with disabilities and allies are put in contact with administrators regularly. We will create a GUSA Working Group on Accessibility that will primarily serve as a space for students with disabilities and allies interested in advocacy to collaborate on policy and advocacy work, but would also be a streamlined relationship for contacting administrators, as it would collaborate with students involved in the Disability Justice Working Group. This will empower students with disabilities to routinely have contact with administrators so that their concerns can be heard and addressed. If elected, we would push for the inclusion of a Disability Cultural Center in the 2018 Campus Plan with space, financial, and personnel considerations. The Center will provide an additional community for those with disabilities, would serve as a central hub for students with disabilities and allies, house disability studies resources, and focus on disability rights and social justice work. We will continue to host speaker events around this topic, but this cultural center will further institutionalize programming around disability as diversity. We will push for the implementation of the No Wrong Door program into New Student Orientation, which will give all students exposure to disability issues, but also reinforce that Georgetown is a home for all students. In addition to this, we will push to have a discussion in the program around ableism particularly at Georgetown so that these conversations become central to a student’s experience from their very first moments at Georgetown. We intend to have use What’s A Hoya? sections to highlight disability culture, and with our expansion of What’s A Hoya to sophomores, we will be able to continue these conversations beyond freshman year to push them to be an integral part of Georgetown dialogue. 2. What would you do if elected to ensure that conversations and initiatives on diversity, especially those managed or initiated by the GUSA Executive, meaningfully include disability and disabled members of the campus community? After you, Lydia, graduate, we are well aware of the gap on this campus around advocacy for students with disabilities. With that in mind, we have come up with the idea of having a group of individuals within the executive dedicated to advocacy work, but also serving as a place where students with disabilities can voice their concerns about issues on campus in terms of accessing resources and inaccessible events. This will be the purpose of our GUSA Working Group on Accessibility. Additionally, it is crucial to engage the entire Georgetown community in conversations on diversity, especially as it relates to ableism and disabled members of our own community. To expand these conversations to as many students as possible, we hope to bring in more speakers to engage in discussions on diversity. We will continue to host speaker events around different aspects of disabilities and we will ensure, through the successful implementation of the centralized fund recently negotiated by the Tezel/Jikaria administration, that events outside of the classroom are accessible. In addition, we hope to include conversations about ableism and students with disabilities with our expanded What’s A Hoya programming. Finally, GUSA can advocate for further recruitment for students with disabilities to Georgetown, so that students feel welcome to the Hilltop from their very first impressions of it. In many ways, the University does very targeted outreach, but lacks in these outreach efforts for students with disabilities. We also need to be sure applicants with disabilities are aware of the resources offered at Georgetown and know that our university seriously takes into account accommodations for these students. The access coordinator that we are pushing for would be able to help coordinate these efforts as they would be in contact with all accessibility resources on campus. 3. If elected, what steps will you take to advocate on behalf of a plan to create and sustain a Disability Cultural Center at Georgetown? It is time that Georgetown stops settling for the bare minimum when caring for its students, especially considering it sometimes fails to even meet this minimum. We must be more conscious of systemic structures that create barriers to access for people with disabilities, particularly on our campus. This can only come through focused, continual dialogue throughout our community. As mentioned above, we will support the creation of a Disability Cultural Center to be explicitly defined with a timeline in the Campus Plan with space, financial, and personnel considerations. The Center will provide an additional community and pride for those with disabilities, would serve as a central hub for students with disabilities and allies, house disability studies resources, and focus on disability rights and social justice work. This Disability Justice Working Group has started to study the staffing at our peer institutions for an access coordinator. This would be one single person at Georgetown responsible for ensuring that we all students can access the necessary resources to attend any event outside of the classroom. This person would manage the distribution of the centralized fund that was negotiated by the Tezel/Jikaria administration. This position is crucial in ensuring that students have the resources they need on this campus, but does not do enough to push reform to the campus culture around disability. This is why we would push for the Disability Justice Working Group to also provide a report on Disability Cultural Centers at our peer institutions, such as the one at Syracuse. We would begin advocating for the DCC as the conceptual plan for the 2018 Campus Plan is completed this summer, but we would use this report from the DJWG, in collaboration with the internal review of accessibility services on campus throughout the next year as evidence to support the need for this Center in Georgetown’s Master Plan. We also think by educating more students on the existing conditions for students with disabilities, and with more discussion around ableism on campus we will be able to garner even greater student support for this center, and demonstrate to the administration that this must be a part of Georgetown’s vision of itself for the next 20 years. 4. What steps will you take, if elected, to increase visibility and representation of disabled students (both with apparent and invisible disabilities) in leadership roles on campus, whether in GUSA or elsewhere? How will you sustain GUSA’s role as a leader in advocating for disability rights at Georgetown? GUSA is primarily an advocacy body but to effectively advocate for the student body, it must be representative, and inclusive of the entire student body. Our executive will incorporate students from all across Georgetown’s campus. We plan to prioritize outreach to and recruitment of diverse student leaders, both in GUSA and throughout campus, but we will have an explicit focus on students with disabilities. We will provide resources to ensure that these students are able to run, and in doing so, we will be very conscious of the systematic barriers on this campus that might hinder students from campaigning. We will hold more specialized summits to familiarize students with GUSA or other leadership opportunities who traditionally have not been involved. As mentioned above, our GUSA Working Group on Accessibility will be a collaborative effort among relevant stakeholders to ensure that GUSA is tackling accessibility policy from every angle possible. Additionally, this body will be able to lead our outreach efforts for students with disabilities who are interested in getting involved with GUSA or other leadership opportunities on campus. Student engagement is a significant portion of our campaign, and we would look forward to partnering with allies and students with disabilities to stage effective, bottom-up advocacy to complement boardroom negotiations with administrators. As a representative to the Board of Directors, Abbey pushed for accessibility to be a regular discussion among the Student Life Working Group on the Board of Directors. Since then, the Directors have pushed for a complete internal review of accessibility services at Georgetown and an access coordinator, both of which we will continue to push for, as well as a complete comparison of our resources to those of our peer institutions. GUSA can use this role on the Board of Directors, as it has in the past year, to make sure this discussion is at the very core of the University’s strategic planning policies. Finally, education is a critical aspect of changing the culture at Georgetown. Disability issues are not fully understood by many individuals at Georgetown, an issue which can be seen on this very survey by the need to define what should be common terms, like ableism. We must tackle this issue head-on by involving students who are working hard on disability issues into all discussions on the topic. Additionally, we need to work toward greater collaboration between disabled students, anti-ableism allies, and non-disabled students. When we bring more people into this important conversation we have the important opportunity to increase understanding of these issues on campus. 5. What steps will you take if elected to investigate the full range of accessibility barriers at Georgetown and advocate for meaningful progress from the administration in addressing them with current campus infrastructure and as part of future construction/renovation/expansion projects? First and foremost, we will ensure that students with disabilities are given the opportunity to sit down with architects of all new construction projects to ensure that their needs will be met in the new building. Our GUSA Working Group on Accessibility will be a place for all students to voice complaints about inaccessible spaces on campus. They will compile evidence of inaccessible spaces on campus into a report. Through regular contact with the administration, we will be able to bring to the forefront the existing inaccessible spaces on campus. We will advocate for the Master Planning process to prioritize the renovation of existing spaces and making them more accessible before we create new barriers with more construction on campus. We will push the internal review of accessibility services for the June meeting, which has been requested by the Board of Directors, to include an assessment of physical spaces on campus, and ensure that our Board representatives are applying continued pressure on the administration to accurately assess this campus. Also, we will advocate for a complete review of digital accessibility over email and website platforms. Additionally, we will advocate for accessible dorm rooms in every residence hall and apartment complex, so that students with disabilities are not limited when selecting between housing options. Finally, we will continue to push the administration to hire an Access Coordinator who will help student organizations provide accommodations for students with disabilities at their events. This Access Coordinator will be able to utilize the new centralized fund to aid student organizations, and provide further guidance on how to host accessible events. Finally, while there are focus groups working to ensure that students with disabilities are involved in the planning of new construction projects, we will publish a Memorandum of Understanding between the administration and GUSA. This MOU will explicitly state that students with disabilities have the right to meet with the architects during the planning of any new construction projects on campus. 6. How will you continue advocacy for further improvements and expansions to accommodations at university-sponsored events and programming? There are several steps that need to be taken to ensure better accommodations at events at Georgetown. First, we will ensure the successful implementation of the recent cost-sharing arrangement negotiated by the Tezel/Jikaria administration. This fund will be accessible for any student or university-affiliated organization. To name a few, this would include programs put on by academic departments, student organizations, and resource centers. The fund would be consider events in three levels. The first is ineligible, in which the event is less than ten people and none of the individuals need funding for accommodations. The second would be eligible events in which we are not sure if any students with a disability will be attending or how many people will be there. The third would be entitled, which is when a person has requested accommodations, or if it is a large public event, such as one with 500 attendees. Second, we will advocate for the additional hire of an access coordinator, who would ensure that students with disabilities are able to attend events outside of the classroom. This access coordinator would distribute funding for accommodations, but also would be a centralized resource for students with disabilities. We would work with them to formalize a policy on how to maintain compliance at our events, considering we are currently on a case by case basis. Third, we will ensure that student group leaders are trained on how to best accommodate student needs by holding workshops for student leaders to learn their necessary resources. Finally, we will ensure that the current guides for accessibility at event programming are updated and in place at Blueprint training. At Blueprint training, we will push for all leaders of student organizations to formally commit to understanding event accessibility protocol. 7. What would you do if elected to advocate for meaningful inclusion of disabled people in conversations about us on campus? While GUSA cannot directly control the actions of other student groups, GUSA can lead by example and facilitate accessibility on campus through collaboration and conversation. Our Working Group on Accessibility will include with students with disabilities and fellow student advocates so that the conversations can be as productive as possible. If elected, we will advocate for increased support and expanded resources devoted towards courses focused on disability studies. As the only ticketing supporting the student campaign for a diversity requirement, our administration will push for the efforts behind this requirement to also incorporate disability access. We believe that it is crucial for these discussions to engage the entire student body. Additionally, we want to expand upon these conversations in an experiential, peer-based learning model using What’s a Hoya?, which we plan on expanding to sophomores. This increase in programming will be funded through our Executive budget, which asks for significant supplementary funding to be appropriated for What’s a Hoya? We would also ensure the inclusion on the “No Wrong Door” program in NSO so that all students know about the resources available to them and feel comfortable accessing them from their first day on the Hilltop. 8. What will you do if elected to advocate for increased availability of supportive services and community resources at Georgetown for students with disabilities, as well as address existing problems? In the long-term, we will ensure that the administration commits to a Disability Cultural Center that can provide supportive services and resources, as well as advocate on behalf of those students. The Disability Cultural Center, as we stated earlier, will provide students with disabilities with a space for community programming, focus on disability advocacy issues, and house disabilities studies resources. This center will ensure better availability of supportive services and will foster a strong community on campus for disability advocacy. Additionally, the inclusion of the “No Wrong Door” program will make sure that students are informed of the available resources from their first days on campus. Meanwhile, the GUSA Working Group on Accessibility will work to address current problems and continue advocacy efforts. 9. What will you do if elected to advocate for reforms to the Involuntary Medical Leave of Absence process? We see several necessary reforms. First, we will advocate for an institutionalized bereavement policy to provide further transparency and accountability on the part of the University. Our Council on Intellectual Health will serve as a place in which students can voice their concerns and frustrations with their access and treatment through University resources, and will act as leverage, encouraging the University to become far more transparent in its treatment of MLOA. Additionally we will be supporting the efforts of the current Subcommittee on Intellectual Health to hold focus groups on the topic of the medical leave of absences so that we can give the University an accurate reflection of its treatment of students with disabilities. Finally, we will advocate for mandatory institutional follow-up after a student returns from a medical leave of absence. We will push to ensure that therapy groups, as well as the focus groups pushed forth by the Council on Intellectual Health separate graduates from undergraduates because we recognize the uncomfortable position that this puts many students in, and causes to the University to fail to identify the differences in experiences between the two. 10. How would you see advocating for expansion and formalization of disability studies related coursework fitting into your administration if elected? The expansion of resources and support for courses related to disability studies would be an important priority for our accessibility initiatives. We would like to see these resources and course offerings expand as soon as possible so that the entire Georgetown community can engage in discussion revolving around ableism and accessibility. We will push for courses on ableism and disability studies to be included in the Provost’s diversity requirement, for which we are the only ticket advocating. We will advocate for a Disability Studies Minor through collaboration with the academic councils as well as the Provost’s committee. We want GUSA to collaborate with work going on outside of GUSA, and we think this is an incredible opportunity to work with the academic councils and display unified student support. While new courses and minors are certainly challenging to push through, we will use our education campaign to garner wider student support on why this is necessary course material, especially at Georgetown, especially when we now have a diversity requirement. We saw with the diversity requirement that strong student support is crucial to making this happen. We will also need faculty to help us push this through, but with the shared consensus by many faculty members and alumni that Georgetown does not do enough to combat ableism or be welcoming to all students, we believe that we will be able to find this support among faculty member. We think that with this new diversity requirement this is a unique opportunity to push diversity studies to the forefront, and we will seize upon this opportunity to work with other stakeholders in presenting the Provost with a proposal for the expansion of disability studies.